Want to know what all the cool kids are wearing? Then look no further than Tumbler and Tipsy. One step into the brand’s showroom and you’ve found mecca for a new generation of club kids. The other day I had the pleasure of visiting this hip little space to check out the new SS14 collection. I’ve been in love with Michael Kuluva and his designs since Tumbler and Tipsy made its runway debut in the fall of 2011. If you’re not familiar with the line you should know that Michael’s creations are more than just clothing. They are artistic pieces that exemplify chic fashion in the modern world and represent a lifestyle that is bold, luxurious, and daring. 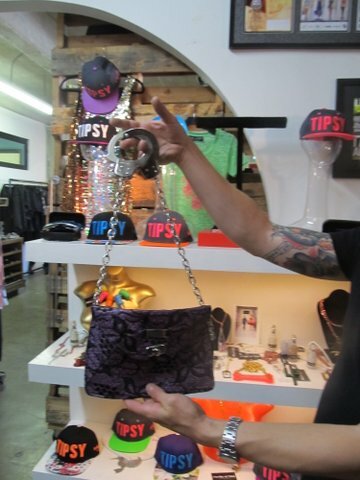 Tumbler and Tipsy’s apparel and accessories are edgy, flirty, and fun much like the designer himself. Michael made a name for himself as a professional figure skater until a chance meeting with designer Roberto Cavalli inspired him to study fashion at FIDM. His love for skating is reflected in the glitter and metallics that have become the brand’s signature staples. For the SS14 collection Michael added more jersey knits in the form of maxi dresses, jumpers, rompers, statement tees, and harem pants (All in playful prints). Of course there were a number of ultra-luxe sequined pieces. Including a few that were reversible, so you can rub your hand across the garment and change from one color to another or create a mottled effect for added coolness. Michael has recently partnered with Swarovski, which ups the glam factor, and is also collaborating with Lil’ Debbie (denim wear), Trevor Wayne (Bow Ties) and Angelyne on a limited edition Billboard Pink Tee for nostalgia’s sake. A number of cool accessories will also be making their debut at New York Fashion Week, such as the neon varsity hats and rubber rings. Personally, I’m all about this killer handbag.